There is a trend of Japanese based dollar stores to expand into Canada, and the Vancouver area is quite a popular destination. Daiso has been here for many years, Mini-So recently opened, and the first full Muji store will be opening this month, after their successful trial of a pop-up shop. Japan makes some of the best and most consistently high-quality stationery products, and I wanted to test some of the Japanese dollar store gel pens to see if they are any good. Daiso has been in Canada since 2003 and is an attractive and upmarket dollar store in the Aberdeen Centre - a predominantly Asian focused mall in Richmond, BC. I recently took a trip there to look at the stationery offerings. The store is on two levels and contains everything from snacks and cleaning supplies to clothes and dinnerware. They do have an excellent selection of paper, pens, and pencils and carry some fun items such as washi tape and stationery storage. You can find Daiso on the ground and first floors of the mall, near the Mercedes Benz dealership. I was very pleased to see a good selection of gel pens hanging on racks. Daiso uses their branded packaging, with most of the labels in Japanese. While this labelling may be tough to get used to, a closer examination shows some English labelling of their products. I found the gel pens which showed the manufacturers of the pens using some co-branding format. I have a preference for finer tips and nibs on my pens and found that Daiso carries Sailor made get pens with 0.38mm tip. I picked up a Daiso / Sailor 1.0mm roller gel pen for comparison. I also found a different style of gel pen made by the Mitsubishi Pencil Co - the Uni-Ball Signo RT, also in the 0.38mm tip which did not have Daiso’s branding on the packaging. Daiso also carries wider tipped gel pens, from 0.7mm to 1.0mm tipped made by quality manufacturers and sold under the Daiso brand. Both of these manufacturers were exciting finds to me. I love the Sailor fountain pens and find their nibs to be spectacular and the smoothest out of the three top Japanese pen manufacturers (Pilot, Platinum, and Sailor). I also find Sailor’s inks, particularly the Jentle line, to be high-performing inks. My Mitsubishi Pencil Co. Hi-Uni pencils are some of the finest in my collection, and I had high hopes for the quality of their gel pens, even if these were dollar store items. All of the 0.38mm pens are clear plastic bodied pens. The Sailor pens have a removable cap and a soft, rubberized, textured grip which is comfortable to use. The tip, end cap and grip are molded in the same colour as the ink, as is the cap clip and end cap. The pens are molded in a slight hourglass shape and fit well into your hand. However, I do have a quadruped grip; I find that my bottom finger does rest below the soft grip. If you grip near the tip, this may also be a challenge for you. These plastic pens are light weight and should be comfortable for extended writing periods. The cap may be posted on the pen body and does not drastically affect weight distribution. The 1.0mm Sailor is of the same design, but with a transparent black body and clear cap. The Uni-ball is a clicker-style retractable pen and is a straight bodied pen and does have a flat, smooth rubber section at the grip. This pen feels more utilitarian and less comfortable than the Sailor pens. If you have used many Extra Fine tipped pens, you may have found that performance and the writing experience can vary. Some feel like you are writing with a scratchy needle and have a hard time flowing ink to the page. Others tend to be so wet that they seem thicker than an Extra Fine and can cause smudging. I tested all of these pens on a Rhodia Dotpad. The Daiso / Sailor 0.38mm blue pen was excellent. A little feedback but not distractingly scratchy, a fine line, consistent ink output and minimal smudging. This pen will become a daily use pen. Unfortunately, the red pen in the same make was a little disappointing. The red ink appeared to be more of a pink colour, and the line was thicker than the blue pen. The ink did not smudge much, and the writing sensation was slightly smoother than the blue. The same make of pen in a 1.0mm was, as expected, super smooth, but felt like writing with a paint brush compared to the 0.38s - it laid down lots of ink on the page. And, as you would expect with that much ink, it smudged terribly. If you prefer a thicker line and have some patience, this may be a good choice. I would not recommend to lefties, due to the likelihood of smudging. As you can see in the comparison image, I also tested a Pilot Frixion 0.5mm and Pilot G-2 in 0.7mm tip size. Surprisingly the Frixion seemed to have the finest lines. The Daiso gel pens retail for $2.00 Canadian. I do recommend the Daiso Sailor 0.38mm gel pens in the Blue ink, and, if you can accept the more pink colour, the red as well. I would not recommend the Uni-ball Signo RT - it just doesn’t feel good. The Pilot G-2 is always a great standby pen, and if you like wet, thick lines, the Sailor 1.0mm will make you happy! The Daiso pens are some of the best dollar store pens that I have tried. 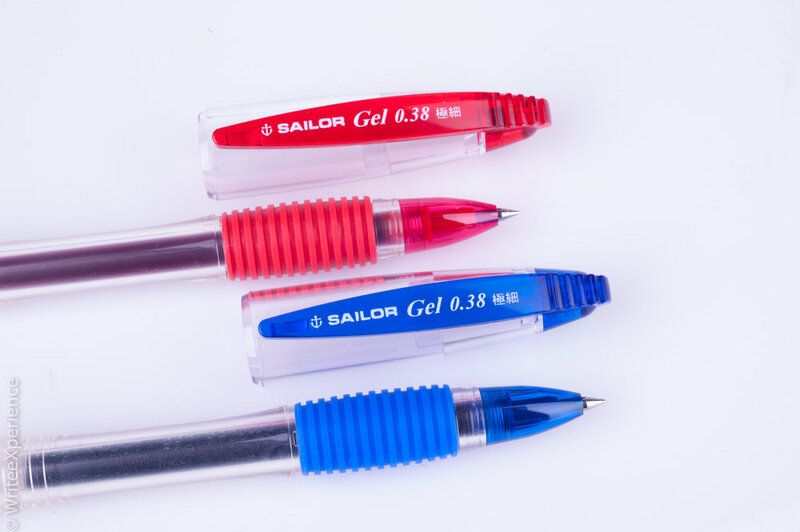 And Sailor proves that it can make gel pens to rival their excellent fountain pens. Please follow Write eXperience on Twitter @writeexperience or Instagram @writeexperience to read more about quality writing products to enhance your writing experience!